Cheap Personalized Buckets - Pails in Bulk. Promotional, 1.75 Gallon - 7 Quart. Budget Prices in America. Optional Recycled Buckets at the same price. Union Made in USA. Heavy Duty inexpensive promotional 7 Quart Buckets in bulk, custom imprinted. We also supply blank (not personalized) bulk 7 Quart Buckets for $3.99 each. 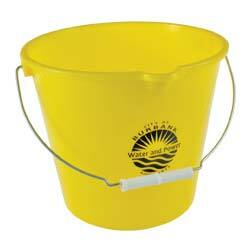 Heavy Duty Multi-use buckets are great for home, auto and boat. Free artwork design and Free proofs! American clients pay no taxes. The unit prices below include your 1-color custom imprint on one side. Add the amount shown for each additional imprint color. We also supply blank (not custom imprinted) bulk 7 Quart Buckets for $3.99 each. Production Time: 7 days; Rush Production of 3 days: add $0.95 per unit. Blank (not custom imprinted) buckets ship next day. Optional Recycled Buckets (same price) are molded with recycled polypropylene. Recycled Buckets Colors: Black, Eco Dark Green, Eco Navy Blue, Eco Tan (see photo). PACKAGING: Carton Dimensions 20"(L) X 20"(W) X 24"(H); Units Per Carton 50; Shipping Weight 50 lbs. PRODUCTION TIME: 7 days after art approval; Rush 3 day production is available: add $0.95 per item. Blank items ship next day.